Starting next year, Apple, Nokia, Motorola, Samsung, and RIM will begin making handsets with a standard phone charger based on the micro-USB connector. The goal is to reduce the number of useless chargers we seem to accumulate and then store in our junk drawers, closets, and boxes in our basements. How many chargers from discarded cell phones, music players, and other electronic gadgetry do you have lying around the house? 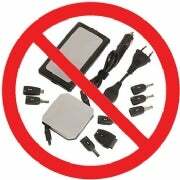 And even if you recycle or (gasp) dump them, those orphan chargers wind up somewhere, often in a landfill or some Third World toxic trash pile. There's good news, though. Cell phone makers in Europe have agreed to a phone-charging standard that uses the Micro-USB interface. If implemented, this change could eliminate -- or at least seriously reduce -- the need for one charger per gadget. Odds are good the U.S. will adopt the standard too. MicroSD, SDHC, Memory Stick . . . ugh! The market for portable data storage has long been a nightmare of cryptically-named puzzle pieces. How about a one-size-fits-all memory card? Again, there's some progress here. Cellphone maker Sony Ericsson recently said adios to the proprietary Memory Stick Micro and may switch to MicroSD, which is the closest thing we've got to an industry standard. Then again, newer and faster memory card formats like SDXC are coming next year, so who knows what'll happen. Is there a less friendly tech gadget than the TV remote? Each has a different layout and requires an engineering degree to master. (Then again, engineers can't figure they out either.) Universal remotes? They're even worse. TV manufacturers should now by now that handheld devices aren't designed to hold 250 tiny buttons. My suggestion: Have Apple design a TV remote, and make it a standard. The iPhone is proof that a user-friendly interface is possible, even on a small gadget that controls dozens of functions. Sure, PC World readers know the difference between Bluetooth, Wi-Fi, WiMax, 3G, and 4G, but the average consumer doesn't. To the uninitiated, Bluetooth and Wi-Fi may seem head-scratchingly similar, and the myriad of wireless data offerings are just as puzzling. WiMax? Forget it. My proposal: Around the time that, say, 5G or 6G wireless broadband appears, we merge everything into one, easy-to-understand spec. I even have name for it: Universal Wireless. There, wasn't that easy? Okay, this will never happen, but I'll propose it anyway. Why can't game controllers be more alike? In a perfect world, Xbox, PS3, and Wii remotes would work pretty much the same way. And there'd be world peace, too. What standards would simplify your tech life?